Norwegian Cruise Line revealed features and amenities for Norwegian Bliss, the line’s sixteenth ship, which will sail to Alaska and the Caribbean with select voyages to the Mexican Riviera beginning in June 2018. 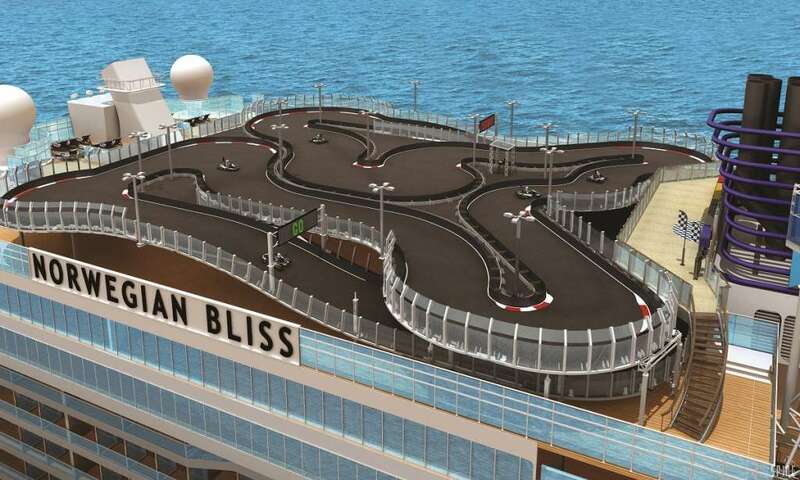 Norwegian Bliss will boast many firsts at sea for the global market including the largest competitive race track at sea and an open-air laser tag course. The ship’s exciting new features will join the brand’s signature elements of freedom and flexibility that Norwegian is known for including a myriad of dining options and a vibrant onboard atmosphere fuelled by a multitude of bars and lounges, award-winning youth programs and more. Many of the ship’s amenities were announced by Andy Stuart, Norwegian Cruise Line president and chief executive officer, at an exclusive event at Virtuoso Travel Week at the Bellagio Hotel in Las Vegas, where media and travel partners were able to Imagine Bliss through interactive 3D virtual reality experiences of the ship’s race track, Observation Lounge, The Waterfront, pool deck and a waterslide. Following the popularity aboard Norwegian Bliss’ sister ship in China, Norwegian Joy, guests will be able to put the pedal to the metal with a two level electric-car race track. The competitive track, the longest at sea at nearly 1,000 feet, will rev up the hearts of all who race around her many twists and turns with four speed settings accommodating novice, intermediate and advanced drivers, reaching up to 30 miles per hour — with a special “turbo boost” available on each lap. The electric cars run silent so as to not disturb those seeking to enjoy the serene environment. 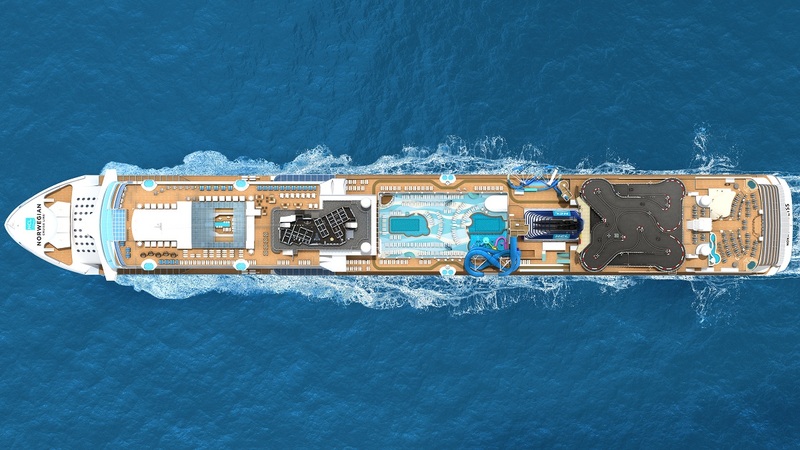 After working up a sweat, guests aboard Norwegian Bliss can cool down at the ship’s expansive pool and sundeck featuringtwo spacious pools and six infinity hot tubs that scale the side of the ship. The ship’s Aqua Park includes two multi-story waterslides. The high-speedOcean Loops free fall slide includes two loops, one that extends out over the side of the ship and a second see-through loop that stretches down to the deck below. The tandemAqua Racer slide allows guests to race side-by-side on inner tubes for more than 360 feet, with a translucent section that provides stunning ocean views. Junior cruisers can enjoy themselves at the Kids’ Aqua Park. The little ones will also have a blast at Splash Academy, the fleet’s award-winning complimentary youth program offering age-appropriate supervised activities for children aged three to 12. Teens aged 13 through 17 will enjoy their own space Entourage, adjacent to the ship’s arcade Even tiny cruisers, ages six months to just under three years old, will have an dedicated space with the fleet’s largest Guppies playroom, where Early Years Coordinators will host sensory-play activities for parents and babies. In line with its youth programming across the fleet, Norwegian Bliss will offer a wide range of family-friendly activities for guests to enjoy including family balloon twisting, interactive games and the Family Glow Party. Modern décor and premium ingredients will meet southern flavours at the all-new Texas Smokehouse, Q anew à la carte specialty restaurant serving authentic Texas barbeque. The flavours aboard Norwegian Bliss will travel south-of-the-border with Los Lobos, an outpost of the brand’s new restaurant serving elevated Mexican cuisine that made its debut in 2016 aboard Norwegian Dawn offering upscale, modern take on traditional favourites. Between Los Lobos and Norwegian’s signature restaurant Cagney’s Steakhouse, The A-List Bar, named for Norwegian President & CEO and 30-year veteran Andy Stuart, will serve handcrafted cocktails, wines and premium spirits. In a nod to the ship’s homeport of Seattle, guests benefit from a full-service Starbucks®store on board and can fuel their day with flavour with Starbucks® coffees, teas and bites available à la carte. Signature à la carte restaurants including French cuisine at Le Bistro; the tastes of Tuscany at La Cucina; the finest fresh seafood at Ocean Blue; global fusion cuisine featuring sushi, dumplings, handhelds and more at Food Republic; Cheeseburgers in Paradise® at Jimmy Buffett’s Margaritaville® at Sea; handmade cupcakes and macarons at The Bake Shopas well as the brand’s family favourite Japanese hibachi steakhouse Teppanyaki round up the offer of specialty restaurants. In regards of complimentary dining Norwegian Bliss will serve up premium quality cuisine with fresh ingredients curated by the brand’s coveted culinary team. In a new complimentary dining concept, The Local will offer guests pub fare in a relaxed neighbourhood atmosphere 24 hours a day. Norwegian’s original beverage concepts will round out the ship’s culinary offerings. The District Brew House serves 24 beers on tap and more than 50 bottled beers, with bites served from the adjacent Food Republic. The Cellars, A Michael Mondavi Family Wine Bar will offer a curated wine list featuring 35 grape varietals. Wine will come to life at The Cellars with interactive educational seminars and tastings daily. Norwegian Bliss’ custom design comes with a wide variety of accommodations including luxurious suites in The Haven by Norwegian®, Studio staterooms for solo travelers with virtual ocean views, and new connecting staterooms ideal for large groups and families traveling together. Norwegian Bliss will also feature an incredible lineup of entertainment offerings including the Tony-Award winner for “Best Musical” Jersey Boys and two observation lounges, including the exclusive Horizon Lounge for guests of The Haven®, perfect for whale watching in Alaska or taking in sunsets in the Caribbean, and more. Continuing its tradition of featuring original artwork on its ship’s hulls, Norwegian Cruise Line has commissioned Wyland, one of the world’s premier marine life artists, to design the hull art for Norwegian Bliss. For more information on Norwegian Bliss, please visit eu.bliss.ncl.com. To book a cruise aboard one of Norwegian’s newest ships, contact a travel professional, call Norwegian on 0333 241 2319 or visit www.ncl.co.uk.